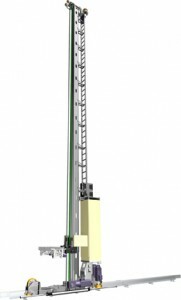 TGW-ERMANCO’s single-mast MUSTANG stacker crane pairs performance with versatility. These automated pallet stacker cranes offer many choices of single or double load-handling devices and operate in temperatures from -22 degrees F to 131 degrees F. The crane reaches a height of 60 ft. The optional anti-oscillation drive enables rapid positioning at highest speeds and accelerations. The Mustang automatically stores and retrieves cartons, totes, and trays in high-bya warehouses and flow racks. Its ideal for high-speed performance. The double-mast Magnus pallet stacker crane from TGW-ERMANCO can handle a working load of up to 2750 lbs. and towers to a maximum height of 60 ft. 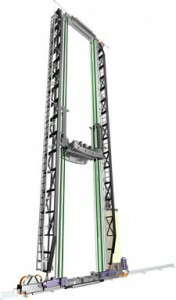 The Magnus out performs other stacker cranes with a travel speed up to 800 f/m. One Magnus can do the same work which would require multiple competing cranes.